This year’s class of Young Global Leader­s Class is compos­ed of 199 indivi­duals from over 70 countr­ies. Marym Nawaz (L), Sharmeen Obaid-Chinoy (R, top) and Shehrbano Taseer (R, bottom) among four Pakistanis on the WEF list. The World Economic Forum (WEF) released its annual Young Global Leaders (YGL) list of 2013 that included four Pakistani achievers among the 199 young leaders from 70 countries. According to a news release by WEF, “the YGL class of 2013 is composed of honourees from all sectors of society, with 50% from business and 50% from arts and culture, academia, civil society, government, media and non-profits; 42% are women”. 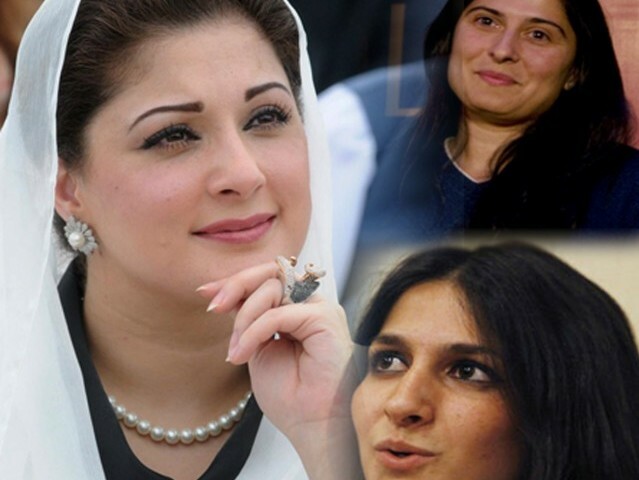 The YGL 2013 honourees from Pakistan include political figure Maryam Nawaz, documentary filmmaker Sharmeen Obaid-Chinoy, founder Pakistan Innovation Foundation Athar Osama and journalist Shehrbano Taseer. Maryam Nawaz is the daughter of former Prime Minister Nawaz Sharif and is currently pursuing a PhD in practical politics. She has been managing her family owned Sharif Trust for the last 15 years, which includes a hospital, schools and colleges. Obaid-Chinoy is an Emmy and Oscar award-winning Pakistani-Canadian journalist and documentary film-maker who works towards raising awareness about women’s issues and rights in Pakistan. Her documentary, “Saving Face” received global recognition since its release in 2012. Osama is a Pakistani scholar who launched Muslim-Science.com, an online journal discussing the issues of Science, Technology, Innovation and Policy mainly concerned with Muslim countries. He is the first Pakistani who was honoured with the World Technology Network award in 2011. Shehrbano Taseer is the daughter of assassinated former Governor of Punjab, Salman Taseer. She works to raise awareness about the rights of the disadvantaged, more specifically women and minorities. Pakistan improves by three ranking points, up from 125 in 2011 to 122 in 2013. Top women professionals speak about how age-old prejudices can be undone. Maryam Nawaz? Young Leader? How come? What is her contribution? who is not sleeping tonight? Who is the 4th Pakistani ? why Marym Nawaz and Shehrbano Taseer? Where is our favorite Fatima Bhutto??? The nomination seems dubious. Marym Nawaz,young leader ??? seriously ? ?give me a break ..what she has done so special ..?? All of them seem to have come from privileged backgrounds. @titan – at least you are admitting Nawaz Sharif is a Leader. Thats a good step forward. Congratulations to all, I hope there would be more in the future. The elites? No, thank you. I get to choose my leaders. Maryam nawaz and no Fatima Bhtto!seriously? Maryam Nawaz? Does handing out laptops make you a leader? Fatima Bhutto was a leader last year!! How does Maryam Nawaz or Taseer’s daughter deserve such an honour? To those who are questioning why Imran Khan’s name isnt there – i think the fact that the list is of Young Global Leaders should be answer enough. Shermeen and Shehrbano definitely deserve to be there, based on the work they have done highlighting human rights abuse and injustice in Pakistan. As for Meryum – am quite astounded! Imran khan is still young in politics. Should be on the list. Fatima Bhutto is a true icon of Pakistan but Maryam is doing great work across Pakistan. She has focused on women and development issues. There are several colleges and technical institutes that she works with. Apart from that she is very active in the cultural activities. Please be positive guys. By the way, I am a PTI supporter but I appreciate good work. I think its a realistic and practical assessment of young emerging leaders from Pakistam. People are criticising for the sake of it only, Imran is 60 years old how can he be a young leader? All of them deserve a Pat cause they made Pakistan Proud. I wish the list included PARVEEN REHMAN. Because it’s about YOUNG Global Leaders. But anyway, I agree with those who think this list quite dubious. 75% of those chosen from Pakistan are women as opposed to 42% world wide………….that has to say something. @Careless Whispers: You do realize it says young leaders? Not a term that has been applied to Imran Khan in years. fake fake fake why not me i think i am a better leader than all of them i have done way more for the betterment of my community. what have they done except they got all the money and power. These World Economic Forum events are fraud. They do nothing. It is just an ego fest for people with money to gloat and say we are wonderful and care about the world at face value. if Shahzad Roy is not included – it shows this list is really not considering on ground reality – and maybe they ask Govts to send names. Im not a big fan of his music – but what this guy has done for education (Zindagi & now Chal Parha) makes me feel proud to share the same generation as him. Dr Azeem Ibrahim the Policy Adviser to Imran Khan was a Young Global Leader at the World Economic Forum many years ago. As usual PTI is well ahead of the game and has the best thinkers. Indeed maryam nawaz deserves much acclaim for looking exceedingly pretty and handing out free laptops bought from taxpayers’ money.